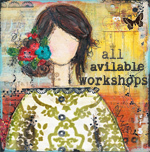 christytomlinson: New Online Workshop! The Creative Planner! Hello sweet friends! I hope you are all having a WONDERFUL week! First,off, if you have come here looking for signups for the Planner Society Kit club, you can scroll down to the next post, OR Click HERE. But today, i wanted to share with you my newest workshop! with Christy Tomlinson & Cori Spieker! Besides being a full time mixed media arts, I am also a planner girl enthusiast! I love creative planning, love keeping my life organized and have an entire IG feed, "theplannersociety", dedicated to my planning craziness! I am beyond excited to be hosting this class with my dear friend, Cori Spieker, also known as " Theresetgirl" on instagram and youtube! She is not only an inspiration to the planning community, but Cori is the creator of the #listersgottalist challenge and the best selling planner stickers, The Reset Girl Sticker Shop. Together we are pumped to bring you the most informative and hands-down creative online planner workshop ever! The Creative Planner, is an online workshop that is ALL about planning, both the functional AND creative side! This workshop is hosted on it's own private website, with all per-recorded videos, pdfs, documents, and photos! So once the class begins, you can access it anytime, anywhere, for 3 full years! This is a great way to learn, as you can go at your own pace and re-watch videos over and over again! We wanted to create a workshop, that not only gave you ideas on creative planning, but how to plan and organize efficiently and effectively! When planning for this workshop, we came up with so much content,over 25 videos and COUNTING,that the class is divided into two parts! Part one, will be all about the functional side of planning and how you can use planning to organize and get more out of your everyday life! To start, Cori and I will go through most of the planners styles and companies available out there today, including ring style, spiral bound style, midori style, and notebook style! We will go over the different sizes of planners, how each one is used, and show different styles offered for each one! We will walk you through the pros and cons of each style of planner, as well as the insert styles offered by different companies. We will discuss different types of inserts (like monthly planning, weekly planning or daily planning).. as well as where to find unique inserts, that fit your personal needs! We will also go over what a dashboard is, how traditionally a dashboard is used, and how dividers can help you plan and organize more effectively. We will show a simple easy way to make a dashboard and dividers, if the planner you purchased, doesn't come with them or doesn't have ones that fit your planning style. (in part two, we will show you how to decorate all of these and even unique uses for them!). Next, we each will show you, our own current planner sets up, where we use functional simple planning. We get asked all the time why and how we use multiple planners for planning. so each of us will go over how we are using multiple planners, what we are using them for and how to keep those organized as well! We will also show you how to set up a monthly, weekly and daily calender, using simple things like, planner stamps, sticky notes, paperclips, notepads, planner stickers, washi tape and markers to keep track of daily tasks. Besides planning, we will show you easy tips and tricks for setting up your planner, to include simple things that can help you plan more efficiently. Lastly, we will give you great resources and ideas on where to purchase planning supplies, different styles of planners, both new and used, how to trade and sell planners you have, that you don't need or want anymore, and also the many planner communities there are on Facebook for not just buying and selling planners, but ideas for planning, free downloads, printable, etc. We will also include some fun bonus videos on our favorite essential planning supplies. We have spent lots of hours researching products to find the perfect things that work for us! So we will share with you our favorites including our favorite pens, markers, stickers, favorite sources for washi tape, favorite brand of inserts, and more! Part one will be all about the functional side of planning. Both how to find one that works for you, and how to use one so that is works for your needs as well. In Part two of the class, we get into the creative side of planning and boy are we going to have fun!! In this week, Cori and I, start out by showing you the planners we have set up that have more of a creative planning style, versus simple! There are many different styles and ways to decorate and creative plan, and we are going to share those with you! In part one, we will show you how to create simple dashboards and dividers, but during part two, we take this to a whole new level! We not only show you more ways to create dashboards and dividers, but also page markers too! We share with you an easy way to turn simple laminated dashboards into cute, creative fun places to inspire you everyday. We love using dashboards in non traditional ways and we want to give you all sorts of ideas on how to personalize them and make them fun and unique! We will also give you downloadable print outs for to use as templates in creating dividers and page makers, including how to make different kinds of dividers (top tabs or side tabs), so you can set up your planner to fit your own personal needs! Besides dashboards and dividers, we will share with you how fun it can be, to use all sorts of creative ideas, to decorate your planner with, where you are excited to open it each day and find it a fun place to plan and stay organized! From making your own paperclips, to creating your own quote cards, the possibilities are endless! Every planner needs a place to store important items, so we also show you lots of fun ways to create your own pockets, envelopes and pouches to fit inside planners. We will share with you simple fast ways, like using transforming a greeting card, or a manilla file folder, to making your own pockets and pouches using scrapbooking paper or cardstock! We will share several different styles to fit all sorts of levels and creative needs. Pockets and envelopes, within a planner can help you not only plan more efficiently and hold fun planner supplies, but they are also a great place to hold important documents, money, receipts, and other loose things, that need to be kept safe. For midori style planners, both Cori and Christy will share with you how to create fun dashboards and covers to fit inside Dori's and how to decorate plain inserts to make your planner more interesting. ALSO several different ways to make pockets, envelopes and pouches for your midoris! SO many possibilities and so much fun! We will share with you how we like to use washi tape, stickers, buttons, ribbons and other embellishments to decorate our monthly, weekly and daily inserts, and how taking a few minutes each week, you can turn your planner into something inspiring and motivating to use each day! Cori and I love both the functional simple side of planning, but being creative souls in nature, turning your planner into a inspirational place where you are excited to plan, helps you become an even more effective planner! We wanted to create a class for you, that can take you through that process from start to finish!! This class is TRULY full of so much information, videos, fun downloads, printables, it is a great value for whats packed inside! With over 25 videos, and counting, this will be a fun class for sure! Class Has Begun but since this is a per-recorded class you can still signup and join at your own pace! your login email will be sent immediately following your payment! I just bought a beautiful mauve dayrunner and am looking forward to learning how to pretty it up! I also want to create a "recipes tried" journal and an exercise journal. Can't wait to get started! Is there a class kit available for this one? ...kit looks adorable and I am looking forward to creating!!!! How would I go about gifting this class to someone? I can't wait to do this class, it will be so much fun. This should be a fun class!!! You are always so creative and although I love my Filofax I wish it were prettier and inspiring of my ideas and accomplishments...thanks for the workshop! I am sure I will enjoy it! !